Almost from the outset of its HPI manufacturing, Philips has produced the 400W variant with two differently shaped arc tubes according to the intended operating position. 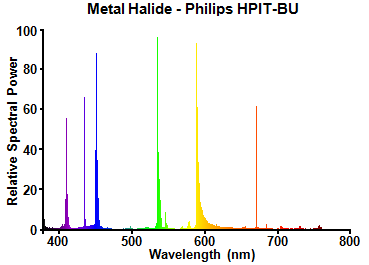 By far the most common is the horizontal type, having a relatively narrow diameter of 15mm and a long arc of 41.5mm. Less well known is the vertical base-up 'BU' type, with a larger diameter of 20mm and a shorter arc of 38mm. As can be seen in the lighted photo, the colour separation when burned vertically is much better than the horizontal lamps. 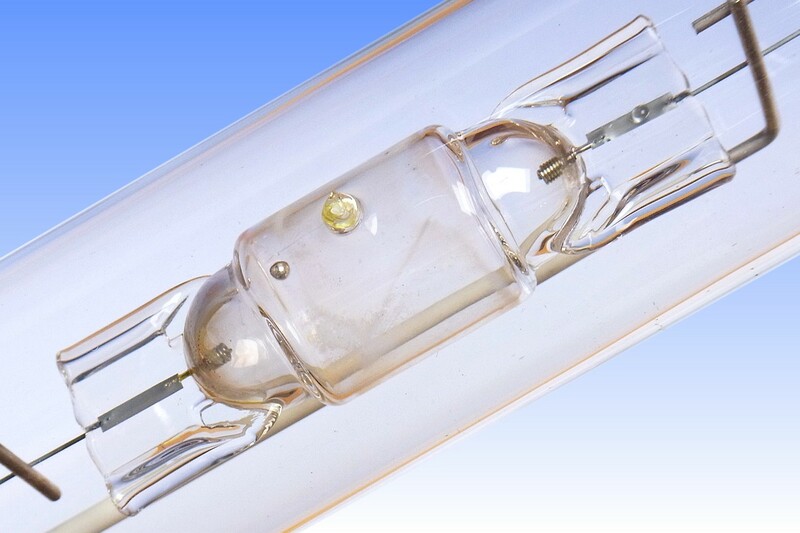 Since horizontal lamps are generally employed in industrial low-bay or floodlighting luminaires, where optical control is important, they are equipped with tubular clear outer bulbs. 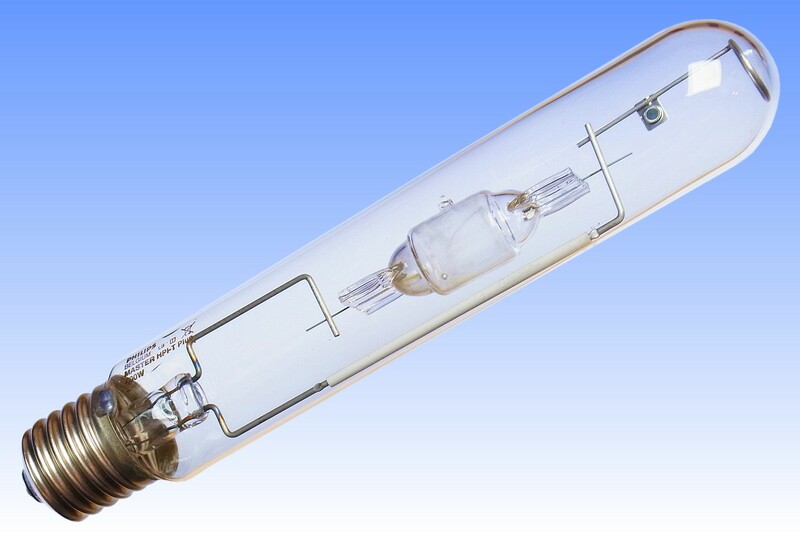 Meanwhile, vertical lamps are usually found in high-bay luminaires where a large light source is beneficial in achieving uniform illuminance and reducing glare, so these arc tubes are mounted in ellipsoidal bulbs having a diffuse coating. 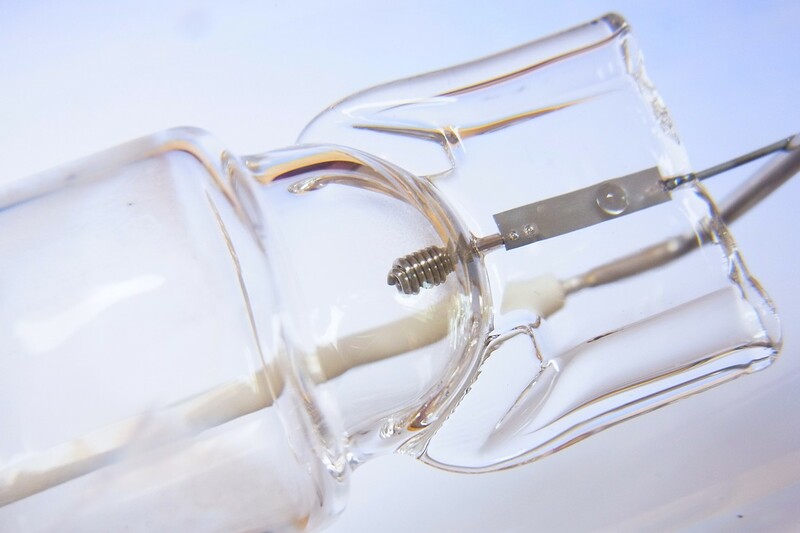 This particular lamp is unusual in that it contains the -BU arc tube within a tubular clear outer bulb. The original -BU arc tubes were sensitive to salt condensation behind the lower electrode, which could lead to corrosion and premature failures - to avoid this a zirconium oxide coating was applied behind only the lower electrode. This lamp is a relatively modern design that has been optimised such that the heat-reflector could be dispensed with. As such it can be operated equally well either Base-Up or Base-Down. 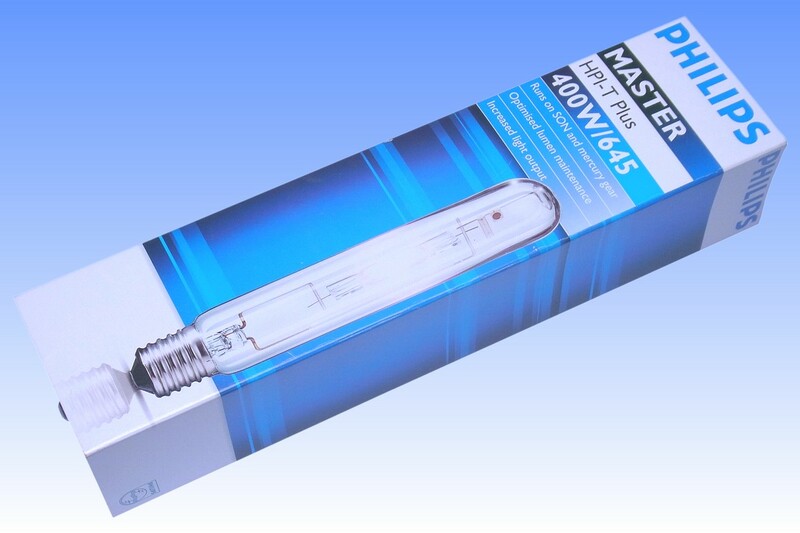 Although the arc tube has been optimised for use on mercury ballasts, this 'Plus' variant can also operate on sodium gear, with higher flux and lower CCT, and also reduced life. The electrodes are much smaller than in earlier models, and note also the double laser-weld to the molybdenum sealing foil. References: 1) Philips UK Catalogue, 2006.